In India the word festival is synonymous with the word excellent food. There is no celebration considered complete unless and until rich food is served among friends, family and relatives. Lots of cooking of good quality food is done and served on festival days. This dish is prepared as an offering to God in every home and temple of south India on any festive occasion like this. I made this on Ganesh Chaturthi, and it was loved by every one! Wash and soak rice in two cups of water for about fifteen minutes. In a small sauce pan, bring to boil half a cup of water and crushed jaggery. Lower heat and slowly simmer until the syrup is sticky (if a drop is taken between the thumb and fore finger, it should feel sticky but not stretch out like a thread). Remove from heat and keep aside.In another sauce pan, bring milk to a boil. Drain water from the rice and add to the milk. Lower heat to medium and cook until the rice is done and the mixture looks thick. Remove the sauce pan and allow to cool for a minute or two. And now add the cooled jaggery syrup from the smaller sauce pan. Stir well. Keep aside. Now, in a small skillet heat clarified butter/ghee and when hot, add cashew nuts. Fry for a minute or two until the nuts change colour to pale brown. Add raisins and stir for a minute. Remove from heat and pour the contents of the above skillet into the sauce pan containing rice mixture. Also, stir in cardamom powder. Keep covered for two minutes. Serve hot along with melted clarified butter on the side. The rice mixture is too hot and when mixed with jaggery syrup results in the milk splitting. 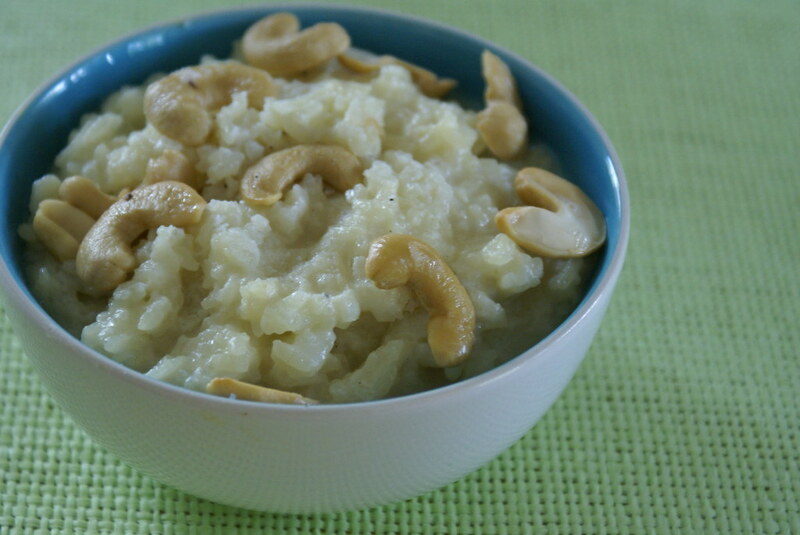 Hence, it is advised to add jaggery syrup to rice only after it has been allowed to cool for a minute or so. This is my entry for the Ganesh Chaturthi event being hosted by Latha of The Yum Blog. this is my all time favo Spanz! yum…and please pass on those cashews to me..i am a cashew hog..
wow! I really miss all these great tastes, Spandan! It has been some time since I visited this blog last. It’s quite amazing to see how u’ve been experimenting and improving. Keep it up! I love this simple yummy prasadham !!!Incredible!! Heyyyy, I just made rice pudding too. I don’t get jaggery very easily, which is a shame though. Looks yummy. Looks yummy ….and must be totally fingerlicking ( i can c it). rice pudding in any form is apprecieated by me…I make numerous versions of it. I’ve never tried making it with jaggery though…seems like it would be a nice addition. I like to refrigerate some and nibble while watching a movie. Love cold paayasam! That is looking yum with loads of cashews. Great entry. beautiful looking bowl of paramannam. can never get bored. 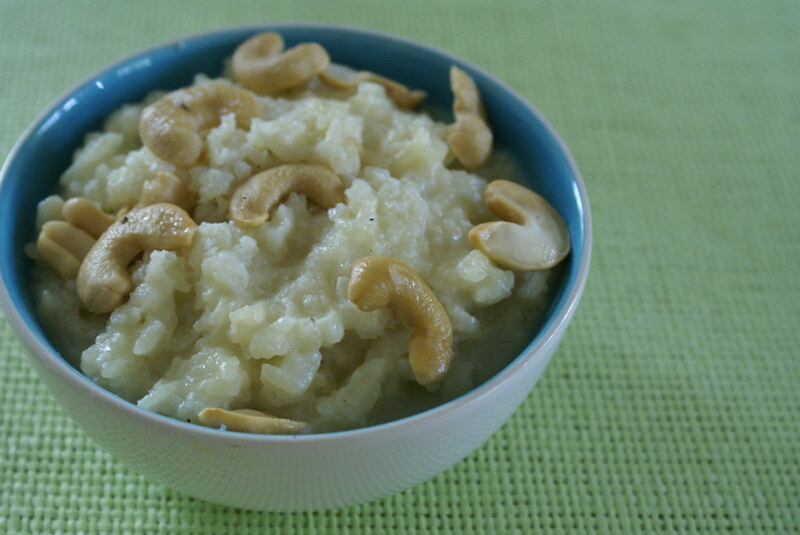 Sweet rice pudding is made in many hindu homes here in the Caribbean too for various festivals. Yours looks so creamy and good. Rice pudding is one of my favourite desserts. Thanks for the lovely entry cinnamon! I just love this sweetened rice ! We call it sarkarai pongal!